Disagreements emerged last night at an EU summit in Brussels between Ireland and other Eurozone members centring on corporation tax. Taoiseach Enda Kenny said he refused the offer of a 1% cut in the €67.5bn EU/IMF bailout interest rate because of the lack of agreement over Ireland's corporate tax regime. However, he said the reality of a 1% interest rate cut for Ireland had now been accepted. The disagreement partly revolved around a so-called 'Pact for the Euro' and the role EU tax policy would play in the pact. The pact is designed to improve competitiveness, employment and public finances within the eurozone, following a year long crisis facing the single currency. The broad outlines of the pact were agreed by eurozone members last night, but the details won't be concluded until a summit at the end of March. Mr Kenny said negotiations would now have to continue intensively over the next two weeks, and they would include a meeting between Minister for Finance Michael Noonan and the president of the ECB Jean-Claude Trichet in Brussels on Monday, with a further possible meeting between the Taoiseach and Mr Trichet in advance of the 24-25 March summit. The Taoiseach addressed the president of the ECB during discussions, although the content of their remarks was not immediately clear. Greece accepted a 1% reduction of its interest rate and was also granted an extension of the repayment period from four to seven-and-a-half years. A short time after the meeting broke up the president of the European Council, Herman Van Rompuy, said Eurozone leaders had ‘refused’ an immediate cut in rates on Ireland's rescue package because Ireland had not ‘met all the required conditions’. A spokesperson for the Government said this meant that Ireland had not agreed to issues relating to ‘tax coordination’ as they appeared in the pact on improving competitiveness within the eurozone. However, he said Ireland would engage in discussion on the subject of a common corporate tax base constructively after the European Commission presents its proposals on the subject next Wednesday. Earlier, President Van Rompuy had said that agreement in principle on the pact's aims had been agreed by member states, with the detail being worked out at a summit of EU leaders at the end of the month. 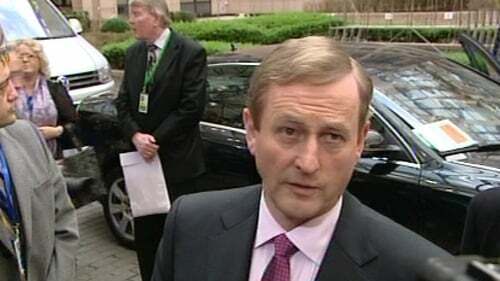 Following reports that strong words were exchanged between the Taoiseach and President Sarkozy of France on the issue of corporation tax, Mr Kenny said there had been a ‘vigorous and vibrant’ discussion. He said Ireland was committed to the EU IMF programme and to reaching the target of reducing the deficit to 3% by 2015. He said he briefed his counterparts on the situation of the banks, and that stress tests should provide a clearer picture of the problems in the sector before the end of March summit. Much of the discussion will now focus on the issue of the Common Consolidated Corporate Tax Base (CCCTB). The European Commission will issue its long awaited proposals on the matter on Wednesday. The idea is that multinational companies, with subsidiaries in different member states, would file one tax return for the entire EU rather than up to 27 as they are required to do at present. The Commission is to present a formula which would apportion which amount of company profits goes to which member state. At that point each member state applies its own corporate tax rate to whichever portion of company profits it is allocated. The Commission's argument - supported by France and Germany - is that this will encourage greater expansion by European companies across borders, and that it will make it simpler and cheaper for non-European multinationals to invest in Europe because their tax responsibilities will be clearer and cheaper. However, the Government has always remained sceptical about the idea, suggesting it could dissuade companies from staying in Ireland.